The Online Shop for Dynojet Dynojet AutoTune. 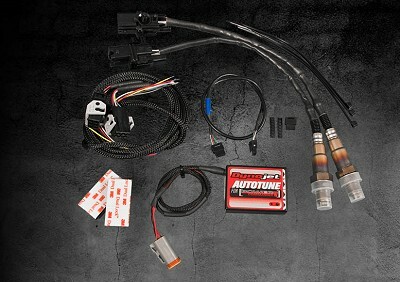 “AUTOTUNE” kits are available that include Wide Band O2 sensors and control boxes. It will plug directly into the PCV and allow automatic fuel adjustments. If we do not have the exact map for your combination of parts you simply need to choose the closest one and let the Auto Tune kit do the rest. (if you have an very heavily modified engine and/or short drag pipes verifying your settings on a dynamometer is recommended). « back to overview "Dynojet Dynojet AutoTune"